It is difficult to begin solving a problem until you admit that the problem exists. One of the reasons that the GFC was so severe in the US was that US regulators had spent the previous decade or two ignoring the danger signs while they proclaimed the virtues of the free market and asserted that bankers’ self-interest was the best assurance that banks would not misbehave. The Chinese authorities, by contrast, have not only admitted that their debt levels are a problem – they have also begun to take action. Since early 2017, Chinese regulators have been clipping the wings of the financial sector – e.g. mandating better capital backing, eliminating flawed products, cracking down on malpractice, reducing inter-bank lending, and jailing billionaires. Problem areas, such as local government loans, are being closely monitored, and the shadow banking sector is being forcibly shrunk. As a consequence, loan growth has slowed. The chart below shows how the ratio of corporate credit to GDP (excluding the financial sector) has actually begun to fall. This does not mean that China is out of danger – any government can always manage to screw things up – but it is a positive sign. The Chinese economy is a key driver of the Australian economy, so this year’s rise in Chinese corporate insolvencies has been taken as a warning sign by some commentators. We, however, see it as an indicator that the Chinese government is successfully reducing the economy’s exposure to financial risk. There are two important things to understand. The first is that China’s insolvency laws are not like Western insolvency laws. In short, creditors have no rights. The second is that Chinese judges are appointed by the Communist Party and they do what the Party wants. The Chinese government has heard of judicial independence, and it’s not having a bar of it. The fate of an insolvent company is determined, not by an administrator and a creditors’ committee, but by a committee dominated by representatives of the local government and the Party. The purpose of this committee is to preserve jobs and economic activity. Hence only small and unimportant enterprises are put into liquidation; bigger ones are restructured so that they can stay in business. Creditors – even the State-owned banks – always have to accept large haircuts on their debt and usually have to take equity in the new enterprise. Therefore China is not about to have a “Lehman moment”. A major insolvency is not the only trigger for a financial meltdown. There are of course other potential crisis points, such as bank runs, market panics, recessions, capital flight, or currency collapses. But the degree of control which the central government exerts over the financial system sets limits to the short-term damage in China. 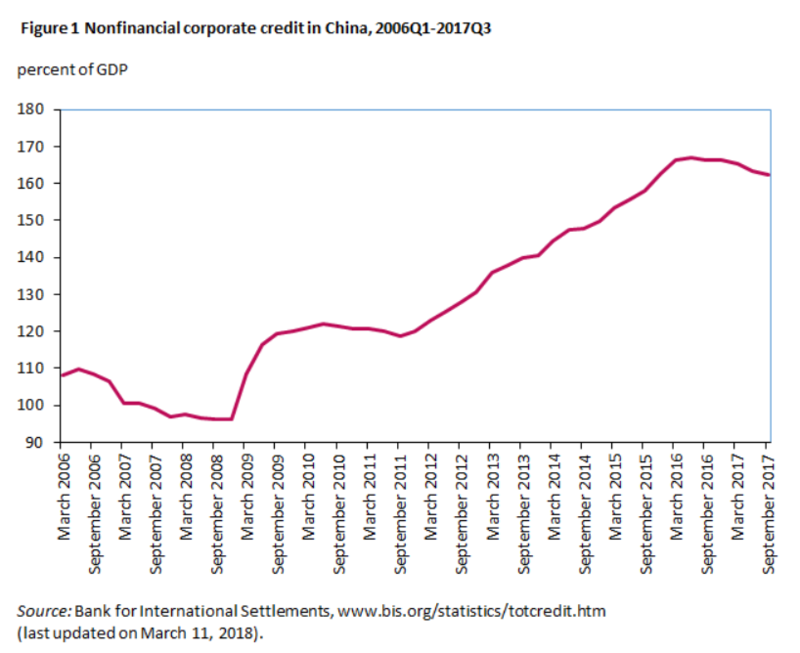 The Chinese authorities are well aware that their controlled slowdown of credit growth and their reduction in shadow banking will cause a credit crunch, more insolvencies, and slower economic growth. But they are equally aware that credit has been growing faster than GDP for a decade, piling up a mountain of hidden bad debts, and that – if left unchecked – this trend would eventually result in a full-scale crash. Therefore we expect, while the authorities will try to mitigate the credit crunch, that GDP growth will weaken in 2018 and 2019. These priorities are a long way from the broad-based construction boom – in housing, commercial property, and infrastructure – which China has enjoyed since the GFC. In short, the three tough battles will push the Chinese economy away from its dependence on Australian coal and iron ore.
We also remain concerned about the likelihood that a US-China trade war will break out later this year. It is very easy for the Chinese government to pump up its short-term purchases of US goods (such as LNG, soybeans, sorghum and semiconductors), but very difficult for it to achieve a permanent change in the US-China trade balance. The main obstacle to any agreement is the American side’s stated desire to hobble the “Made in China 2025” program, which it claims will provide unfair subsidies to Chinese industries. This is a non-negotiable item for the Chinese, who see the program as their way to escape US dominance in high-tech industries. Slower growth in China suggests weaker commodity prices because China has been the main driver of global demand growth since 2002. The “three tough battles” mean that Chinese economic growth will not use as much physical resources as it has in the past, although demand for clean fuels such as LNG is increasing. The focus on developing high-tech industries reinforces the switch away from coal and iron ore toward intellectual property, advanced materials and highly skilled labour. All these trends imply that Australia’s resource sector will underperform, except for oil and LNG stocks, which will depend on prices in the energy sector.